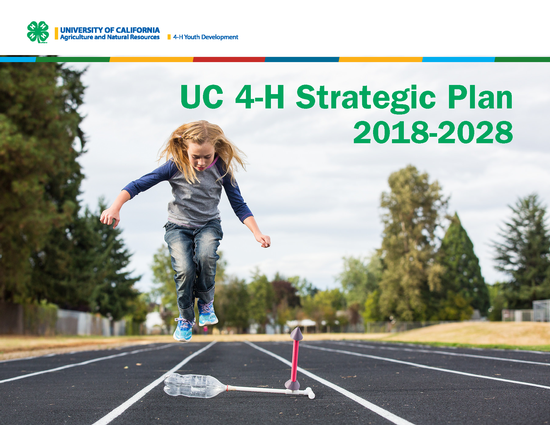 The University of California 4-H Youth Development Program has published a new strategic plan designed to increase its impact. The mission of the UC 4-H Youth Development Program engages youth in reaching their fullest potential while advancing the field of youth development. 4-H is a model for the program and practice of positive youth development. 4-H promotes positive outcomes for young people through the direct delivery of programs (e.g., 4-H clubs and 4-H camps) and through other formal and nonformal settings (e.g., schools and military installations). UC 4-H provides training to practitioners and educators, and extends research-based information and educational content to the community to enrich and enhance the lives and well-being of young people in other settings. In addition, UC 4-H academics contribute to the knowledge base through conducting applied research in the areas of positive youth development, science education, healthy living, civic engagement, leadership development, college and career readiness, inclusivity, volunteer development and management, and professional development for staff and volunteers. The complete plan is available at UC 4-H's website: http://4h.ucanr.edu/About/Mission.